What Is The Most Popular Shoe On Instagram? Instagram has transformed the sneaker game. The medium provides an arena for sneakerheads to flaunt their pickups and to get the edge on drop dates. At the core, it's big business generating content for a multi-billion dollar industry. I think we all feel we have an inkling of what type of posts kick the likes into overdrive but are we actually on the mark? In what might be a pioneering move, Social media monitors Venngage ran the numbers to unearth the most popular shoe on Instagram - and the results may surprise you. ASICS Gel-Lyte III. In a period punctuated by a polarizing (but nevertheless hyped) Yeezy release, the ASICS retro runner reigned supreme with 26 mentions as opposed to 24 (a small margin but still notable as a win for the small guy). 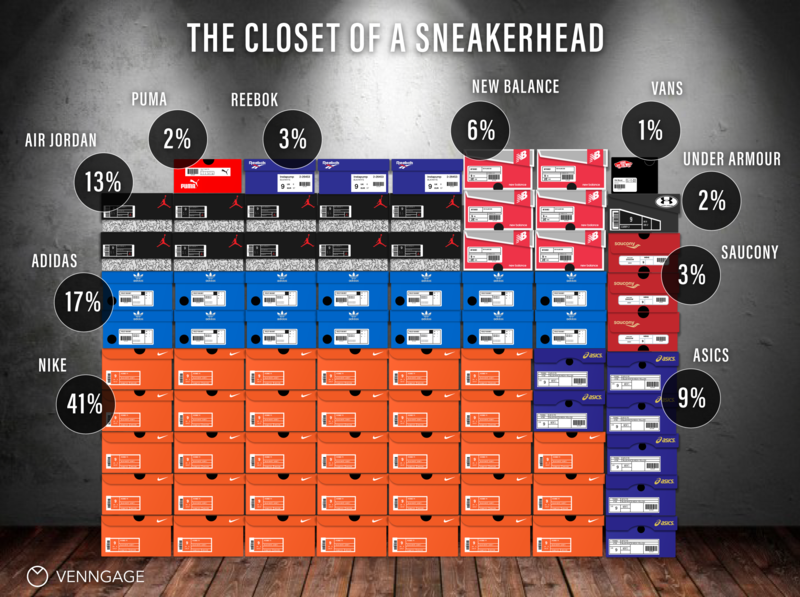 Unsurprisingly, Nike came out on top as the most mentioned brand with 41% of all shout outs. This figure cranks up a notch to 54% when you include subsidiary Jordan Brand. Rival team adidas came in second with 16% of all mentions although Yeezy did actually jump over Jumpman (as the second most grammed over Jordan 11’s fifth place). Rounding out the top five (not including Jordan Brand); ASICS (9%), New Balance (6%) and Reebok and Saucony tied (3%). All stats and images via Venngage.